Attention nut lovers! MyBlogSpark is a company that works with bloggers to provide reviews about products for companies. 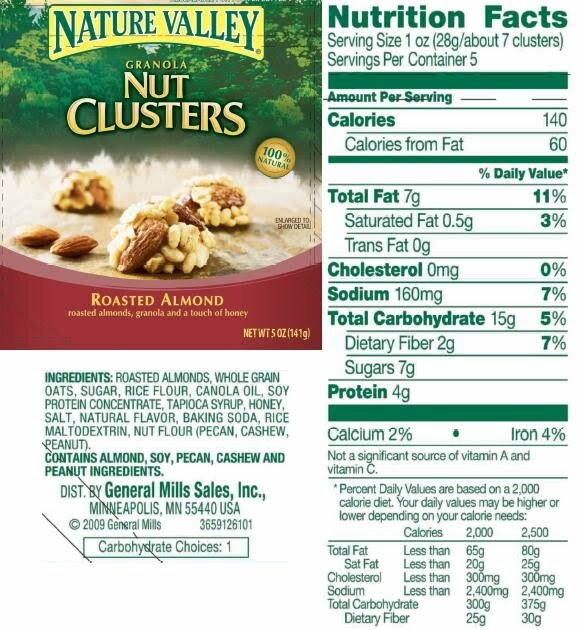 I got the honor of checking out Nature Valley’s new Granola Nut Clusters through them. I’d forgotten that I’d even signed up for the review until receiving my package in the mail and feeling like I was opening a Christmas present. First, I found a sweet day-pack sized bag made from 50% post consumer waste materials. It’s the perfect size and shape to hold some snacks, a water bottle, a knife, map, and first aid kit for a day hike. Even my husband commented on how much he liked it! Secondly, I found a small pair of binoculars, a flashlight, and a stainless steel water bottle. These aren’t the most expensive thing on the market, but they’re decent. The binoculars are clear (would be good to keep in the car for those times when you need to spy on a suspicious character at the grocery store), the water bottle doesn’t contain scary chemicals, and the flashlight has good beam strength. Lastly, included were full size bags of each of the new Granola Nut Cluster flavors: roasted cashew, nut lovers, roasted almond, and honey roasted peanut. Since I had jumped back on the weight-loss bandwagon, I first read all of the ingredients. Surprised and happy was I to find that they’re using all natural ingredients! I quickly opened three of the bags to sample the clusters. Bite size and flavorful, these aren’t salty or too sweet. They would be good on a hike because you aren’t left with unquenchable thirst and they’re high in protein. Each bag reseals making travel and freshness easy! Buy It! Check your local grocery store, or shop online for General Mills. Win It! MyBlogSpark is giving away this same prize package to one of my readers. You will receive all four flavors of the Granola Nut Clusters, a handy dandy 50% recycled sling backpack, a pair of binoculars, a flashlight, and a stainless steel water bottle! To enter, you must share your best camping/hiking/nature tip with us. Be sure to leave a separate comment for each entry and to include your email address each time. Contest ends Friday, October 9, 2009 at 0730 hours, EST. PS- while you’re visiting Nature Valley’s website, they have a link where you can play a game and win some pomegranate granola bars or movie tickets…it takes a minute, and I actually WON the package of granola bars! Always check all of your gear before heading to your camping destination!! We went camping a year ago and got there after dark – when we got the big electric light out we realized we had never uncrewed it and put the bulb in. We set up with our lantern but when I went to inflate our air mattress we didn't have any batteries!!!! 2nd outdoor camping tip – take plenty of snacks, you never know how long you will end up being on the trail for! I have your green clean button on my blog. Yes, I am beginning and have a lot of work to do, but I plan on keeping this up. I follow your blog but I could not get a picture to upload, I will try that again later. Check the weather report and all your gears CLOSELY before heading to the trip! http://tcarolinep.blogspot.com/ “Green Cleaning” button added. Avoid camping in wide, low creekbeds, especially in the raining season!